Aside from the porch, the chimney is the most susceptible structure on a house to the weather’s natural elements. This is because of its detachment from the security and insulation provided by the rest of the home. Metro Detroit Masonry offers Detroit chimney repair and chimney rebuilding in the metro area, including Birmingham, Grosse Pointe, and Royal Oak. The chimney is usually the first part of a building that suffers damage to its masonry because of its exposure to harsh weather. When masonry structures crack, water can penetrate the surface and the “freeze-thaw” reaction can further deteriorate the structure do the expansion and contraction of the freezing and thawing water. Even small cracks can cause serious damage if not maintained. 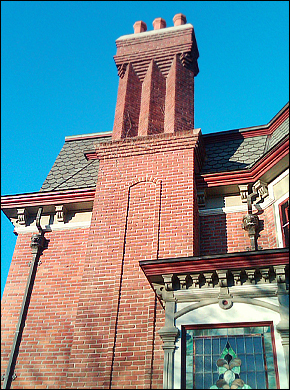 Metro Detroit Masonry has several chimney technicians devoted to a wide range of chimney needs. Warranties are offered on most projects. Metro Detroit Masonry has a chimney-cleaning crew that is able to perform a full 10-point inspection while cleaning any standard house chimney or wood burner. Our starting price is $65. Call Metro Detroit Masonry today at (248)906-CTV3 to schedule a chimney cleaning or inspection today!